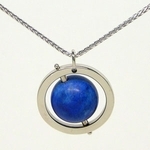 Sapphire is the traditional gift for a 45th wedding anniversary. 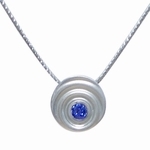 We carry several original pendants set with sapphires! Or simply choose any of our romantic jewelry! 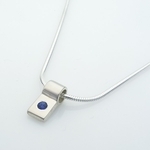 Sapphire is the traditional gift material for both the modern and traditional anniversary gift list. It's a colored gemstone, that is usually a shade of blue, though it sometimes is found in other colors, as well. Like a ruby, a sapphire is also formed from the mineral, corundum.